It is going to take some team to stop New Zealand retaining the Webb Ellis Cup and on the basis of this performance and what we've seen from the other teams remaining at the tournament they won’t be stopped. The All Blacks threw history aside as they obliterated France at the Millennium Stadium, consigning bad memories of 1999 and 2007 to the dustbin as they ended Philippe Saint-Andre’s reign and left French rugby reeling. They face South Africa in Twickenham next Saturday and even the Springboks must be trembling. The response to the defeat at this venue eight years ago transformed New Zealand rugby and something similar is needed in France now. The out-dated Guy Noves hardly seems like the answer, but something needs to happen if Les Bleus are to be a force again. That’s not New Zealand’s problem. Their sole concern is winning this tournament outside of home soil for the first time. This was a statement performance, from the spine-tingling Haka onwards, they were simply awesome. Ireland had shown how pace and possession can unlock the French at the same venue, but while Ireland lost some senior men in the most physical game of their tournament to date, the All Blacks barely seemed to notice France were there as they ran in try after try. times to rack up the highest score France have ever conceded in a Test match, two short of the record losing margin in their history - also to the All Blacks in 2007. It was the second biggest margin at any game of this World Cup. And it could have been worse. It was ominous from the off. After five minutes of the quickest rugby you’ll see, Dan Carter got the chance to open the scoring when Thierry Dusautoir held Aaron Smith at a ruck and he made no mistake from right in front of the posts. Scott Spedding got a chance to reply almost instantly when Brodie Retallick was penalised for hands in ruck and he nailed his kick from just inside his own half with the help of the right post. That lifted the huge number of French fans in Cardiff and the team seemed to draw inspiration as they began to attack from deep through Spedding, but when things slowed down and Freddie Michalak opted to kick, Retallick charged the out-half down and then picked up the loose ball to score. Carter converted as the veteran France out-half limped off injured to be replaced by Remi Tales. Considering the way he started the game missing tackles and with the charge-down, it was probably no harm. New Zealand failed to deal with the kick-off, however, and with their first visit into opposition territory France landed a second penalty as Jerome Kaino drifted offside and Morgan Parra obliged. 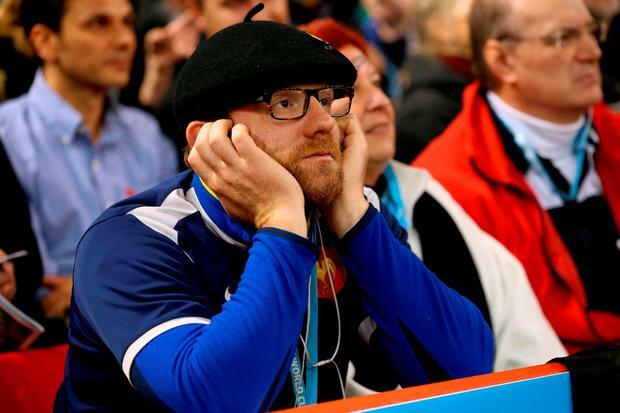 Suddenly, though France were in the game. Despite allowing New Zealand win their own kick-off, some uncharacteristic loose play from Conrad Smith on the deck saw Wesley Fofana and Noa Nakaitaci pile through and Julian Savea went offside to allow Parra narrow the gap, but he sent his penalty wide. After looking so rampant in the opening stages, the All Blacks were beginning to look human despite a brilliant restart game that was denying France entry into the game. Nakaitaci caught a Parra box-kick above Savea before it took three men in black to halt Louis Picamoles’ charge down the left. New Zealand tightened things up and reverted to the pick and go before Carter lined up a drop-goal Guilem Guirado read his intentions perfectly and knocked it on, but when the world champions recovered the ball and moved it wide a brilliant Conrad Smith offload to Nonu set Nehe Milner-Skudder up one-on-one with Brice Dulin and the prolific winger side-stepped the converted full-back to score. Carter nailed the conversion and France were in real trouble. A silly Picamoles off-load put his team in all sorts of bother and, but for Wyatt Crockett belly-flopping on a ruck, the nine-point lead would have been extended. They didn’t have to wait long as, with more than 50 minutes still to play, Savea effectively put the result beyond doubt thanks to some magic from Carter who handed off Pascal Pape and put his winger away with a sweet out-the-back pass that did for Nakaitaci. With so much time remaining, France faced a choice. Go meekly, or start swinging. They might have welcomed the first scrum when it came on 32 minutes, but New Zealand marched them backwards. It was so effective that, when Picamoles picked the ball up and marched half-the-length of the field. France scented blood, Dulin came off his wing and got involved and, when a loose pass fell kindly for Picamoles he hauled a couple of All Blacks with him to score. Parra knocked over the conversion, but if France fans were dreaming of 1999 when they came back from 24-10 down, they quickly woke up. Ben Smith brilliantly caught a Carter up-and-under over Picamoles’ head, before Aaron Smith moved it wide to Savea who channelled his inner Jonah Lomu, handing off Nakaitaci, sweeping aside Spedding and powering through Rabah Slimani’s tackle to score. That brought a phenomenal 40 minutes to a close and France would be forgiven for not wanting to return to the field. They did and they came out to play, using one of Joe Schmidt’s favourite plays to send Fofana through a big gap, but New Zealand forced a turnover and escaped from their own line. Suddenly, France were delving into a locker no one knew they had. Using moves rarely seen under Philippe Saint-Andre, they were having a go from all over and, while New Zealand were dealing with it, they were beginning to feel the pressure. A Nakaitaci burst gave them field position and a lineout an opportunity to pounce. Richie McCaw came in from the side and, when Nigel Owens awarded France a penalty, he clung on to the ball as Parra attempted to wrest it off him. Picamoles took exception and grazed a few knuckles off the All Black skipper who lay prone for way longer than he should. The officials bought it and the penalty was reversed as the No8 received a yellow card. No one makes you pay like the All Blacks and within a minute or two Jerome Kaino was scampering over in the corner to make it 34-13. It was getting embarrassing for France who were being forced to run it from everywhere and, when the errors eventually came, New Zealand were happy to oblige as Nakaitaci knocked on and Savea scampered down untouched. With the contest long over, the men in black began having fun as Keven Mealamu found Kieran Read with a smart off-load to put him under the sticks. For their next trick, they went for an exhibition in offloading. 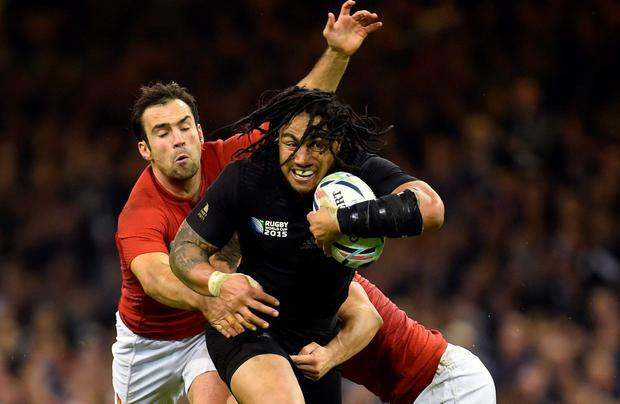 Sonny Bill Williams found Nonu, he found Tawera Kerr-Barlow and he touched down. Carter made it 55 points – equalling the tally England racked up at Twickenham against France on the final day of the Six Nations with 11 minutes to go. It only took another minute for the replacement scrum-half to scamper over again, this time from a Victor Vito off-load after France had ceased hostilities and effectively stopped tackling. Ben Smith and Nonu might have made things worse, but at that stage you just wanted the slaughter to finish so shambolic were France. When it did end, the remaining teams at this World Cup must have considered heading to the exits themselves. On this form, none of them will live with the champions. NEW ZEALAND – B Smith; N Milner-Skudder (B Barrett h-t), C Smith (SB Williams 52), M Nonu, J Savea; D Carter, A Smith (T Kerr-Barlow 67); W Crockett (J Moody 28), D Coles (K Mealamu 62), O Franks (C Faumuina 50); B Retallick, S Whitelock; J Kaino(67), R McCaw (capt) (S Cane 71), K Read. FRANCE – S Spedding; N Nakaitaci, A Dumoulin (M Bastareaud 61), W Fofana, B Dulin; F Michalak (R Tales 13), M Parra; E Ben Arous (V Debaty 61), G Guirado (D Szarzewski 57), R Slimani (N Mas 61); P Pape (Y Nyanga 50), Y Maestri; T Dusautoir (capt), B Le Roux, L Picamoles.